To see the CURRENT version of this page, Click here. 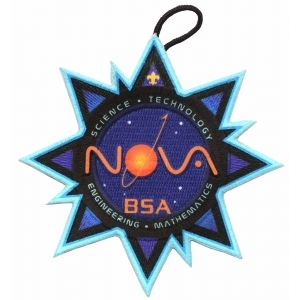 The Boy Scouts of America’s STEM Nova Awards program incorporates learning with cool activities and exposure to science, technology, engineering, and mathematics (STEM) for Cub Scouts, Boy Scouts, Sea Scouts, and Venturers. These activities and associated awards stimulate interest in STEM-related fields, and show how these subjects appear in everyday life and the world around us. Counselors and mentors help bring this engaging, contemporary, and fun program to life for youth members. There are awards designed for youth in the Cub Scout, Boy Scout, and Sea Scouting/Venturing programs, and are optional in each program. Requirements must be completed while registered in the BSA in the appropriate program and subject to standard age limitations. 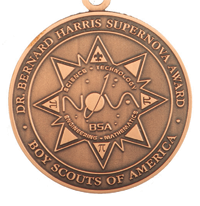 There are multiple Nova awards for each level: Cub Scouts, Webelos Scouts, Boy Scouts, and Sea Scouts and Venturers. Each award covers one specific subfield of a STEM subject area. 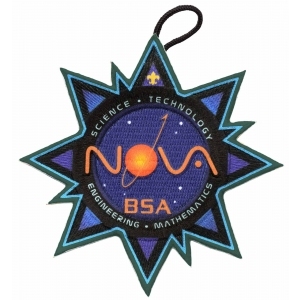 Upon earning their first Nova award, Scouts receive the distinctive Nova Award patch. 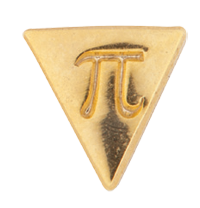 For each Nova earned after that, a Scout earns a separate pi (π) pin-on device that attaches to the patch. As of August, 2018, there are nine Nova awards for Cub Scouts (Wolf and Bear levels) and Webelos Scouts, six for Boy Scouts, and five for Venturers and Sea Scouts. 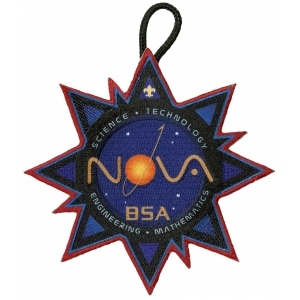 Originally, there were four Nova awards for each program area, each covering one component of STEM - science, technology, engineering, or mathematics. Three additional Cub Scout awards covering Earth Science, Wildlife and the natural world around you, and Space Exploration, were added in 2015, a fifth Boy Scout award, covering Agriculture was added in 2017, and two more Cub Scout awards, covering Symmetry and Archaeology, plus a sixth Boy Scout award and a fifth Venturer award covering water were added in 2018.